With just one phone call, we can make your hen weekend happen! Friendly staff can make any changes to your booking with no hassle! We know all the best places for you to stay! Would you like someone to organise all the details of your Hen Weekend in Aviemore for FREE? Girls - its time to swap your gladrags for dry suits to experience an adrenaline rush on one of the most exciting rafting rivers in the UK.► 2 Nights Accommodation, White Water Rafting, Cocktail Making and a 2 Course Meal. No matter if you are looking for a highland fling, to ride a highland cow, maybe even do a bit of sheep herding. Ok so you won’t want to do any of those things, but the fact of the matter is that Aviemore is now one of the most popular places for a hen weekend. The backdrop here is just spectacular and there really is no other place that offers a setting like Aviemore does slap bang in the spectacular Scottish Highlands. A hen weekend here is one that is packed with fun outdoor activities. This is the kind of place where you have a wild (and in many cases damp!) time during the day and then a relaxing evening with more than a few glasses of wine. What You Hens Can Get Up To On A Night Out! While most hen parties come to Aviemore for the amazing array of day time activities they can do. You can still have some fun on a night out! The Woodshed Bar is really cool place to grab a glass of wine and have some damn good, Scottish food. The Woodshed Bar is just what you would expect from a highland bar. It has the whole wood thing going on and despite being very modern inside, it has a somewhat rustic look to it. When it comes to your hen party having a nice meal then The Woodshed Bar is one I cannot recommend highly enough. In fact it is my favourite haunt! Walking down the main street after the night before and discovering that everyone says "Hi"
Are you ready to party in Aviemore’s number one nightclub? Well actually this is the only nightclub in the place, but that means it’s very popular and has a great atmosphere. The Vault is a great place to come if you ladies want to get a little wild, crazy and just dance the night away. If you are not too tired out from all the cool stuff you have been doing during the day then a visit to The Vault is a must, just to see the hairy Highlanders dancing after a hard day in the hills looking for lost coins in the heather! How To Have Fun During The Day! This is what a hen weekend is all about –having fun. Aviemore’s success is down to a number of things but one of them is that it offers some of the best outdoor activities in the whole UK. Here are some of my favourite things you ladies can get up to! But to mix it up I have added a couple of more laid back suggestions as well. Not every Hen Weekend has to be boring! White Water rafting-here we have the most popular activity for a hen weekend in Aviemore, if not the UK! White Water Rafting is an absolute blast and you will get to do it one of the best rivers in the whole of the UK! 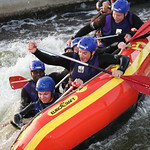 People come from all over the UK to experience white water rafting here! This is really intense, but do not worry as you will be decked out in all the best safety equipment and have experienced instructors to keep an eye on you and make sure you are having fun, screaming, crying and laughing. Expect to get wet! Archery is a great laugh and an outdoor activity that everyone in your hen party will be able to take part in no matter what their fitness level is. Archery is a sport that will make you feel like you are some kind of Wonder Woman or you are in the movie Brave Heart. Archery is a sport that is easy to pick up and learn, but hard to master. This is a great way to have some fun in the outdoors without needing to be super fit. The Winking Owl, Cocktail Making Lessons- Yes this is a bar and you can get a drink and a great meal here that is sensibly priced. 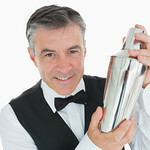 The main reason I have put this here for you ladies is that they offer a really fun course on teaching you how to make your own cocktails. This is just so much fun and you will have a great time. Will any of you actually be able to make nice cocktails? Well finding out is what makes this such a great hen do event. After you have had a hard day taking part in some of the more extreme activities that are on offer in Aviemore, Cairngorm Beauty Therapy & Spa offers your posse of women a great range of ways to unwind and get ready for a chaotic night on the town. The backdrop of the stunning Cairngorm mountains, hills, slopes or whatever you want to call them really does make this a spa like no other! It is even better in winter when it is -10C outside and +35C in the spa! Where The Heck Is Aviemore? Many think that this is located in an area so remote that you need to hire some kind of guide and a few donkeys to get you there. (The donkeys may well be some of the locals). Aviemore I will admit can take a while to get to, but it’s actually relatively easy. You can get here by both train and bus, heck you can actually get on a train in London and it brings you straight here! So train is a very easy (and probably best) way to get to Aviemore. What Really Makes This The Perfect, Special Place For Your Hen Weekend? As cheesy as this sounds, Aviemore is a really magical place and no matter all the crazy activities or the fun and friendly local pubs that were visited, one of the first thing people will say about the place is what a friendly hospitable place it is. The backdrop here is just jaw dropping and honestly without over selling the place, there really is no place in the UK that is like this! A hen weekend here at Aviemore is one you will all remember forever. HenHeadQuarters believes that it provides the best value for money for Hens and Hen Weekends in Aviemore. If you can prove us wrong- which we doubt- then we will match or beat any genuine "like for like" quotation for Aviemore based Hen weekend.